Many people believe that this statement gave the green light to those who, a few weeks later, burst into Pat Finucane’s home and shot him dead. That’s not how I see it. The people responsible for Pat Finucane’s death tended not to wait on the words of politicians before acting. At the same time, Hogg’s words must have given considerable encouragement to the killers. A similar situation was played out here last week. Orange Order leaders were loud in their condemnation of the Parades Commission ruling that Orange marchers not pass the Ardoyne shops on the evening of the Twelfth. 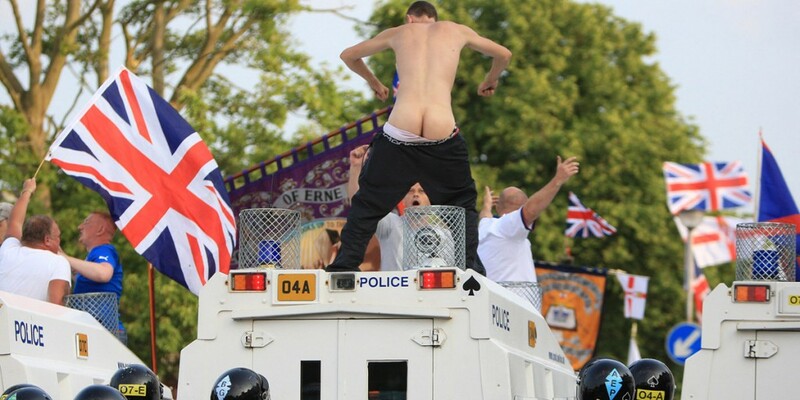 The Parades Commission must be abolished, this was violence being rewarded, no surrender! Words like that were not essential to the vicious rioting that ensued. But rather than throw cold water on the bonfire, Orange leaders chosen to empty cans of verbal kerosene. There’s nothing like a bit of affirmation from ‘respectable’ society to get the wild boys reaching for the golf balls and pieces of masonry. What followed was watched by most of us through the medium of television. At times it was like something from a Kafka novel. In the live morning programme, Walter Love did his usual how-interesting-and-charming commentary on the marchers and their many banners. The evening programme on UTV (I didn’t see the BBC counterpart programme) was an example of scheduling at its most absurd. In the news before the edited highlights of the Twelfth, viewers got Marc Mallett’s breathless comments on the chaos and footage of the hysterical savagery still going on. Immediately afterwards we had the soothing tones of Paul Clark presenting the Walter Love-type highlights of happy marching bands and grandas eating ice-cream in the sun. Is there no irony department in UTV? Any assessment of the situation raises some obvious questions. Like, do Parades Commission decisions have any standing in law? Because it’s obvious the Orange Order chose simply to ignore its rulings. Only hymns when passing St Patrick’s Church? Don’t be daft – a blast of The Sash there, men. And march on the spot while you’re doing it. Maybe the Orange Order have a point after all. If the Parades Commission can be openly defied and nothing happens, why have a Parades Commission? And then there was that brick which hit Nigel Dodds on the head. Was it a brick which brought him and the DUP closer to or further away from the alienated section of working-class East Belfast? One newspaper report suggested the brick was aimed at Dodds, not the police, because of the contempt the rioters had for his efforts to bring about an end to rioting. Dodds will certainly receive some sympathy for putting his head on the line, so to speak, and suffering for his beliefs. Whether that suffering came about because somebody had a bad aim or a very good one in the end won’t matter. All that’ll matter will be, did it help or hinder the DUP regaining that Naomi Long seat? And all this springing from a unionist insistence, at official level and on the street, that their culture is under attack. Hermann Goering is claimed to have said: “When I hear the word ‘culture’ I reach for my revolver.” When unionism hears the word ‘culture’, some reach for inflammatory words, some for bricks. Judging by the events of last weekend, unionism is a community which feels the ground falling away from under its feet. When you suffer that kind of insecurity, you’re likely to say or do anything.